The Cr 2p3/2 spectrum of chromium nitride (CrN) can be fit using the following peak shape parameters (for a 20 eV pass energy spectrum). Note that other reports suggest a higher binding energy position of up to 576 eV [1,2]. The peak shape is asymmetric and much broader then the metallic peak. There is a slight hump near the top of the peak on the lower binding energy side of the peak. Assessment of the amount of nitride present in the Cr 2p spectrum should be taken in light of the amount of nitride seen in the N 1s spectrum and the total amount of N and Cr in the survey spectrum. The spectrum presented below is consistent with that reported on in Reference  taken using a lower resolution instrument. The spectrum from  also shows an asymmetric peak shape and has a FWHM of 2.9 eV however the lower binding energy hump is less discernible. 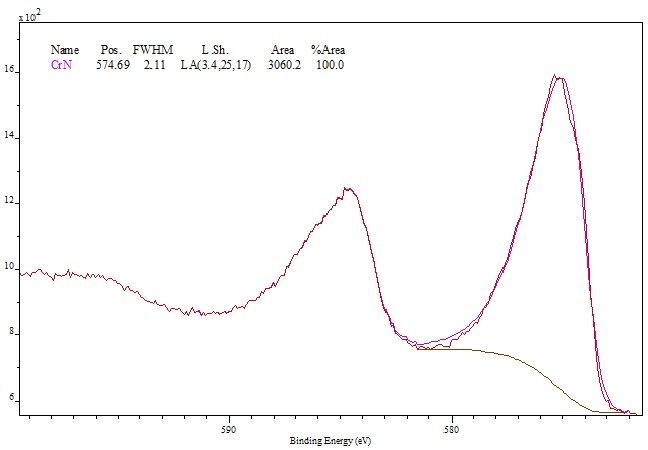 Cr 2p spectrum of chromium nitride (CrN). O. Nishimura, K. Yabe. J. Electron Spectrosc. Relat. Phenom. 49 (1989) 335. A. Lippitz, Th. Hubert, Surf. Coat. Technol. 200 (2005) 250. I. Milosev, H.H. 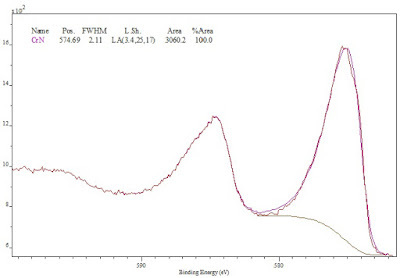 Strehblow, B. Navinsek, P. Panjan, Surface Science Spectra, 5 (1998) 138.